We just got home this afternoon after spending the last 5 days in St. Louis visiting Charlie’s extended family and my blog friends. It’s been a whirlwind of a trip, but it was SO much fun. 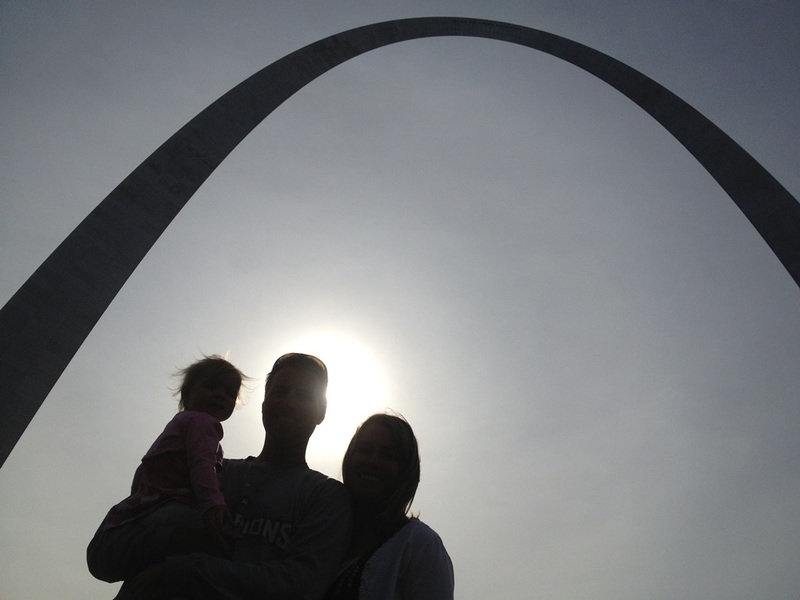 More details later, but here is a quick shot of my fam at the arch on Sunday morning! I love this picture…so awesome! This photo is just amazing!!! 🙂 Frame it! I have a picture like this but it’s just Stan and me. I need to get back there soon and take one of the three of us. Saw your pics on Steph’s blog! How fun that you guys got to meet up! Yep – I was stoked to get to see her again for sure! Amazing! Love the back-lighting and the silhouettes. Definitely a framer. Really cool picture. Before visiting the arch a couple years ago, I thought it would be lame but it was actually really cool. Having a serious fear of heights, I was amazed at all the workers in the video who braved crazy heights and strong winds to build that thing. Never could have done it.